Nationality: American. Born: San Jose, California, 16 January 1890. Education: Attended California public schools and Santa Clara College. Military service: Served in photo department, U.S. Navy, 1917. Family: Married Margaret Balach. Career: Member of David Belasco's Los Angeles stock company, 1911; stage actor in Lloyd Hamilton comedies, 1913; worked in Chaplin comedies, 1916; actor at Mutual, 1918, and at Triangle, 1919; director for Mack Sennett and Lloyd Hamilton, 1921; moved to Warner Bros. and directed first feature, Broken Hearts of Hollywood , 1926; moved to 20th Century-Fox, 1944; finished career with two films at Universal and two at RKO, 1953–54. Died: In Burbank, California, 15 November 1955. Meyer, William, Warner Brothers Directors , New York, 1978. Fuments, Rocco, editor, 42nd Street , Madison, Wisconsin, 1980. Feuer, Jane, The Hollywood Musical , London, 1982. Roddick, Nick, A New Deal in Entertainment: Warner Brothers in the 1930s , London, 1983. Altman, Rick, The American Film Musical , Bloomington, Indiana, and London, 1989. "Lloyd Bacon . . . Warner Brothers' Ace," in Cue (New York), 6 April 1935. Parsons, Louella, "Cosmopolitan's Citation for the Best Direction of the Month," in Cosmopolitan (New York), May 1949. Calanquin, L. V., "Best of the B's: Sons of Guns," in Classic Images (Muscatine), no. 136, October 1986. Haralovich, M. B., "The Proletarian Woman's Film of the 1930s: Contending with Censorship and Entertainment," in Screen (Oxford), vol 31, no. 2, 1990. 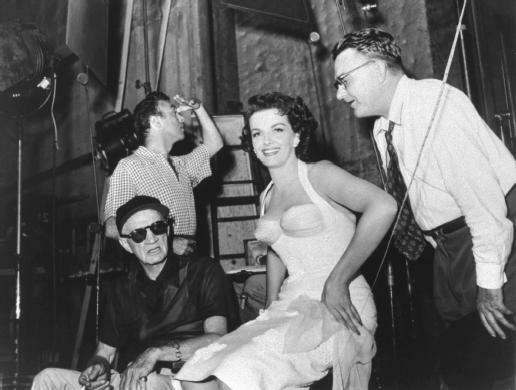 Lloyd Bacon (left) with Jane Russell. Lloyd Bacon is probably best known for his director's credit on such classic Warner Bros. films as 42nd Street, Footlight Parade, Knute Rockne—All American , and Action in the North Atlantic . Still, other film personalities are better remembered for these films: choreographer Busby Berkeley for the musicals, and actors Pat O'Brien, Ronald Reagan, and Humphrey Bogart for the 1940s films. Today Bacon is lost in the literature about Warner Bros. In his day, however, Lloyd Bacon was recognized as a consummate Hollywood professional. One cannot help standing in some awe of Bacon's directorial output in the era from the coming of sound to the Second World War. During those fourteen years he directed an average of five films per annum for Warner Bros. (seven were released in 1932 alone.) Bacon's 42nd Street and Wonder Bar were among the industry's top-grossing films of the decade. For a time Bacon was considered to be the top musicals specialist at Warner Bros. The corporation paid him accordingly, some $200,000 per year, making him one of its highest paid contract directors of the 1930s. Bacon's status declined during the 1940s. His craftsmanship remained solid, for he knew the classical Hollywood system of production as well as anyone on the Warner lot. But Bacon never seemed to find his special niche. Instead, he skipped from one genre to another. He seemed to evolve into the Warner Bros. handyman director. His greatest success during this period came with war films. For example, Wings of the Navy had a million dollar budget and helped kick off the studio's string of successful World War II films. Bacon's best-remembered film of the 1940s is probably Action in the North Atlantic , a tribute to the U.S. Merchant Marine. This movie was Bacon's last film at Warner Bros. In 1944 Bacon moved to Twentieth Century-Fox to work for his former boss, Darryl F. Zanuck. There he re-established himself in musicals as well as films of comedy and family romance, but still seemed unable to locate a long-term specialty. He finished at Fox with an early 1950s series of Lucille Ball comedies, and ended his directorial career in somewhat ignominious fashion, helping Howard Hughes create a 3-D Jane Russell spectacle, The French Line . Bacon's most significant contribution to film history probably came during his early days at Warner Bros. as that studio pioneered new sound technology in the late 1920s. Bacon presided over several significant transitional films, none more important than The Singing Fool. Although The Jazz Singer usually gets credit as the first (and most important) transitional talkie, The Singing Fool should receive far more credit because for more than a decade, this film stood as the highest grossing feature in Hollywood annals. As its director, Bacon was honored by the trade publication Film Daily as one of the top ten directors of the 1928–29 season. As a consequence of his involvement on this and other films, Bacon established his reputation as a director who helped thrust Hollywood into an era of movies with sound.